Ghost Bunny was already aboard Quantum the Time Travelling Train and the rest of the gang could feel the effect of Quantum's powerful engines. But the Ice Mice had no choice. They were drawn aboard as if compelled to travel. Quantum started to shudder and shake. "All aboard, all aboard!" shouted the Wabbit. "Please have your travel documents ready," shouted Skratch. "No liquids, no lighters, no plastic forks," shouted Lapinette. Quantum's shaking stopped and the train began to hum in an increasingly strange tone. "This is your Captain speaking," intoned Ghost Bunny over the loudspeakers. "In the unlikely event of being frozen in a different dimension, please use the oxygen masks and sick bags provided." The gang could hear a muted chattering. "I guess the Ice Mice just picked the wrong train," said Skratch. "What time is it?" asked Lapinette of the Wabbit. "Six five," he said, "and the station is a shakin'." "Shall we then board?" said Lapinette. "Wouldn't miss it for the world," said Skratch. Ghost Bunny slid back the cabin door and they all lurched on. The Wabbit looked around. "Quantum, we meet again," he said. "Commander," said Quantum. "Welcome aboard. Our destination is Galaxy T104. Ghost Bunny has already walked around." 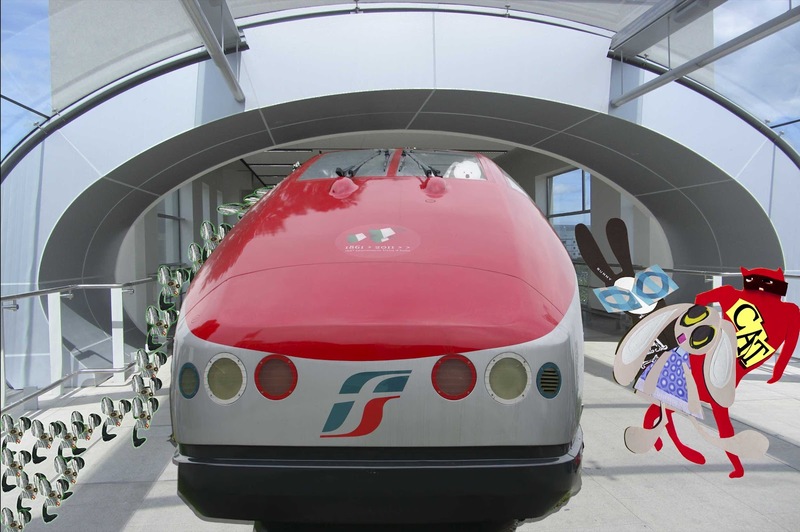 "I haunted round and all is well," said Ghost Bunny, handing the Wabbit a sheaf of paperwork. "OK," said the Wabbit and he hopped on the footplate. "Out and up, Quantum. Nice and easy." There was a sudden shudder, then a flash and all that remained was a faint smell of engine shavings.